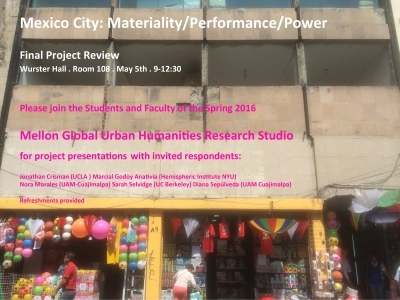 This interdisciplinary research studio will focus on Mexico City as a composite city: a complex space of palimpsest histories and possible futures that emerges through the materiality of urban experience. 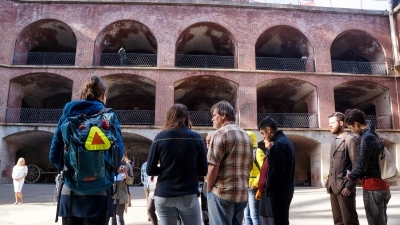 The course will explore the relationship between material histories, cultures and the performance of power through site-specific interventions and research projects based in three zones of engagement: the historic center, the Roma and Condesa neighborhoods, and the Western periphery. Student projects will be included in a subsequent book on Mexico City, to be published in English and Spanish, which expands on course themes and issues. The class will be conducted as a project-based seminar. Students will be expected to participate in additional activities to be scheduled at a mutually convenient time, including film screenings, guest lectures, project pin-ups and/or research presentation related to individual and group projects. Students will develop an interdisciplinary toolkit of urban research methods and creative practices through participation in the course. A funded field trip to Mexico City will take place from March 18-27, 2016. Open to grad students, juniors, seniors. There are no prerequisites for this class. Studio experience and Spanish language skills are encouraged but not required. An info session will be held on Nov. 3, 2015, at 5:00 p.m. in 126 Dwinelle Annex. Interested students should write to thomas.murdoch@berkeley.edu for information about the application process and other details. Applications due by Dec. 4, 2015, at noon. Selected applicants will receive a CCN on Dec. 7, 2015. She began with awakening our senses by asking us to closer our eyes for just a few minutes.